Christmas can be a special day, but it can also be a lot like every other day: A terribly-fit Retriever got popped in the 0.5 security system known as Uedama. Xcalybur1 didn't know to fit a tank, but at least he had the excuse of being a new player. 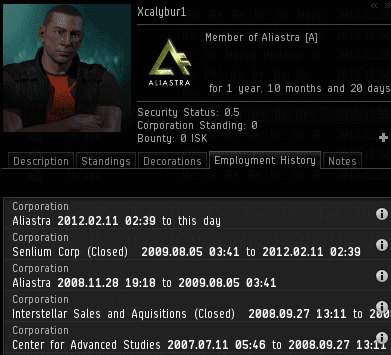 Xcalybur1 has only been playing EVE for about six and a half years. He hasn't moved out of the highesc mining phase of his career just yet. The carebear apologists will tell you that every new player needs at least a few years of absolute safety to grind isk in highsec, otherwise they'll quit the game and CCP will go out of business. This would be terrible, since EVE would be shut down and nobody could grind isk in highsec anymore. Agent Nu'adu performed the gank because the Code is more important than CCP's business model. Luckily, after six and a half years in EVE, Xcalybur1 knew not to take it to heart. Nu'adu would get no tears from this carebear. 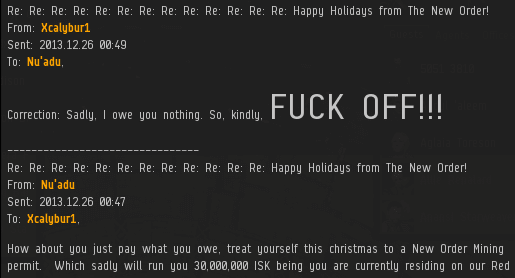 Actually, Xcalybur1 wasn't filled with the Christmas spirit this year. Nu'adu sent him a follow-up EVEmail just to make sure he was okay. According to some versions of the legend, King Arthur pulled the Excalibur out of a stone, where it had lain for centuries. Xcalybur1 is the kind of guy who would be more interested in the stone. But surely he couldn't have meant what he said about Nu'adu's mother. ...On the other hand, Xcalybur1 missed his Retriever very much. The only silver lining was that Nu'adu's mother's corpse would rest in a grassy plain rather than a desert. Xcalybur1 was softening. For someone who had decided to play a multiplayer PvP game as a pacifist miner, Xcalybur1 was rather fixated on death and violence. Regardless of his psychological issues, Xcalybur1 was still responsible for his crime of mining without a permit. There is no insanity defense under the Code. Incredibly, the guy who spent six and a half years mining in highsec questioned the value of Agent Nu'adu's EVE career. Nu'adu was quick to defend his record. By the way, anyone who enforces the Code can put me down as a reference when applying for a job. Just have the employer contact me by EVEmail. Xcalybur1 revealed that he considered himself a hero because he protected Nu'adu's freedom by repairing airplanes. I'm not sure if he assumed Nu'adu is an American, or at least a member of a NATO country. Regardless, this formed the basis of common ground between the two heroes. Nu'adu concluded his next reply, "I thank you for your service. Isn't it about time you thanked me for mine?" Xcalybur1 seemed determined to remain on the Red Pen list--not what you would expect from a "hero" in the U.S. Air Force. Now Agent Nu'adu was blocked. Apparently freedom of speech wasn't one of the freedoms that Xcalybur1 protects for us all. The evidence was clear. 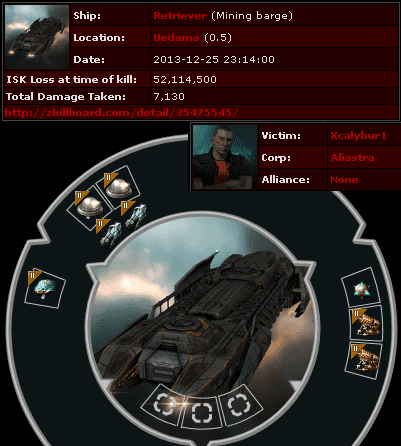 Xcalybur1 was guilty of conduct unbecoming of a miner. A little more than an hour later, Xcalybur1 decided to upgrade the Retriever fit that had failed to protect him before: He now had a tech II inertia stabilizer. To add an extra layer of protection, he moved his operations an entire jump away. But somehow, Nu'adu caught up with the miner. Nu'adu's helpful EVEmails were blocked, but not his antimatter. How fitting the best tears of the year should come on the last day of the year. I would like to make it clear, If I were that maintainer's Sergeant, I would make it clear that they need some help. This is clearly not a good sign that they would respond with such strong emotions in as something as minor as EVE. It's like you hit an officer spawn but it was full of tears instead of purple loot. If I could +1 this, I would. WOAH. That guy needs to take a step back and get a breath of fresh air. That was some intense anger coming out over a video game. If only he knew that he would be immortalized by his words on that day. "Clearly he doesnt want to be harrassed anymore"
We must not be reading the same EVEmails, what I saw was someone begging as hard as humanly possible, and perhaps harder, to be 'harassed' more. I put 'harassed' in quotes because realistically, the only person violating the TOS here is Xcalybur himself. Carry on and enjoy your complete inability to understand anything whatsoever, you have been warned. Someone should conduct an outreach investigation to find out how he reacted to his second loss after blocking Nu'adu. Perhaps the new order complaints department make a house call? Former USAF officer here...B1 Lancers are only stationed in two locations in the US. if I were a current B1 crew member at Dyess AFB or Ellsworth AFB I would not want this raving psychopath maintaining my aircraft. James - Thank you for exposing this grave risk to the readiness of the US Strategic Nuclear Forces. The violent ideations expressed by Xcalybur1 following simulated space combat in a computer game about space combat have been exposed and I am sure that the counterintelligence agents at Defense Security Service and AFOSI will immortalize him further! James315 - Savior of Highsec AND Western Democracy! Brilliant post -keep up the good work! Hilarious ! Keep up the good work.